Immigration: UK detention report calls for "radical shift"
UK detention report calls for "radical shift"
LONDON, 3 March 2015 (IRIN) - Following a parliamentary inquiry into the use of immigration detention in the UK, a cross-party panel of MPs has released a hard-hitting report calling for major reforms of a system it describes as “expensive, ineffective and unjust”. “We detain far too many people unnecessarily and for far too long,” said Sarah Teather, a Liberal Democrat MP who chaired the inquiry which was launched in July 2014 following a number of high profile incidents of abuse at the country’s 11 Immigration Removal Centres (IRCs). Although government guidelines state that “detention must be used sparingly, and for the shortest period necessary”, the inquiry found that in practice this policy was not being followed. Compared to other European countries, the UK detains more migrants and asylum seekers for longer periods of time. The report notes that over 30,000 people entered the UK’s detention centres in 2013 compared to just over 4,000 in Germany which receives four times as many asylum applications. It is also the only European Union country that lacks a time limit on immigration detention. Mental health practitioners told the panel that individuals who spent less than a month in detention mainly required treatment for underlying mental health problems. “After longer than a month, practitioners told us they are trying to deal with problems associated with detention itself,” Teather told IRIN. 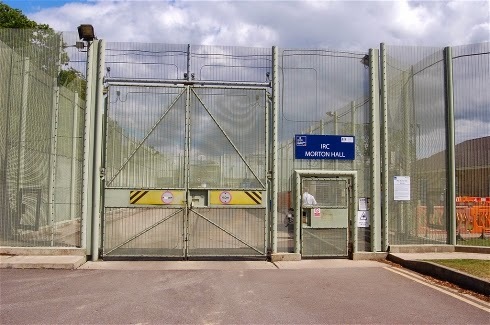 The report recommends that immigration detention be limited to a maximum duration of 28 days, but it also calls for detention to be used much less frequently. Instead, it recommends the use of community-based alternatives such as those already being used in countries including Sweden and Australia that are both considerably cheaper than the UK’s current system and achieve high compliance rates. The report also makes a number of recommendations relating to conditions inside detention centres and the treatment of detainees. It argues that detainees should have better access to both legal representation and health care and that screening processes be improved to avoid the detention of trafficking and torture victims and people with mental illnesses. “Many individuals who are currently detained have experienced trauma in their past and detention is wholly unsuitable,” it notes. More fundamentally, however, the report calls for “a wholesale change in culture” and “a very radical shift in current thinking” about the use of detention for the purposes of immigration enforcement.